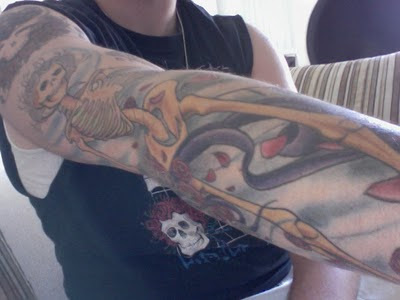 Yoel sent in 2 tattoos that comprise this sleeve. This Sunflower Farmer Bertha looks great, and Yoel says it isn't quite done yet, and more work is to be done in the next few weeks. You can see the Space your Face from post #80 in the top of the picture.